Are you looking to save space while adding value to your selection room? Look no further. Our Aegean® Healing Tree® burial vault wall display got lots of attention at the 2012 NFDA Convention, and for good reason. It can help you boost your sales, and stay ahead of the competition as you offer the families you serve new and innovative ways to honor their loved ones. 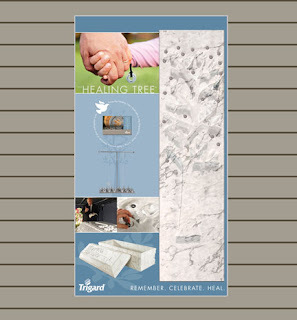 Learn more about the Healing Tree or call Customer Service at 800.637.1992 to order a wall display today.